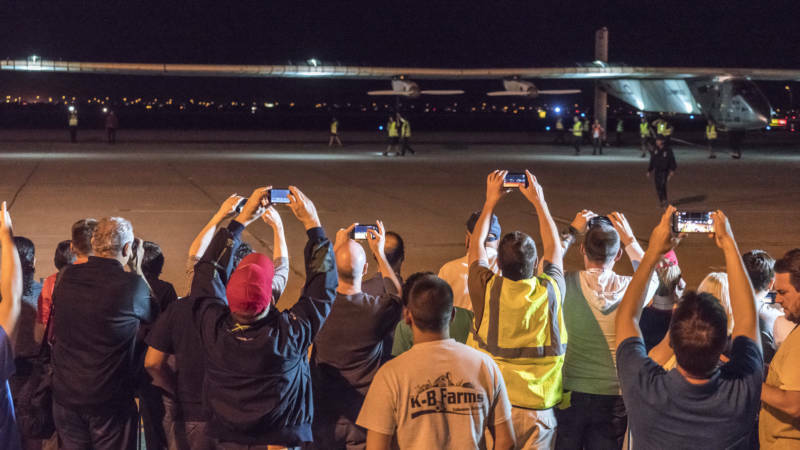 "The average speed of Solar Impulse 2 is 45 mph. But the tailwinds were too strong for some portions of the flight — so to slow down, the pilot had to sometimes turn the plane around and fly into the headwinds, essentially flying backward toward Phoenix. Other than that, the pilot said it was a great and sunny flight over the desert." Swiss pilot Andre Borschberg was at the controls for the plane's 10th stage of a round-the-world flight. Borschberg alternates flying duties with project founder Bertrand Piccard. The fuel-free flight project started in March 2015, but it was put on hold in July after the plane's batteries developed problems during a five-day flight from Japan to Hawaii. It resumed its journey last month, completing a three-day trip from Hawaii to Mountain View, Calif. The Solar Impulse 2 uses energy gathered from 17,000 solar cells on its surface to power itself. The craft weighs roughly 5,000 pounds and has a wingspan of 236 feet — wider than a Boeing 747. As the Two-Way reported when the plane left Hawaii, the team hopes to end the journey where it began last spring, in Abu Dhabi in the United Arab Emirates.